I received free samples of POM Wonderful mentioned in this post. By posting this recipe I am entering a recipe contest sponsored by POM Wonderful and am eligible to win prizes associated with the contest. I was not compensated for my time. It’s the second week of January. Aka: about the time when everyone runs out of healthy dinner ideas. Sound familiar? It’s easy to fall into a dinner rut, cooking the same few dishes over and over. Maybe it’s because you can’t (or don’t have time to) think of anything else. Or maybe you just automatically buy the same ingredients each time you go to the store. If you find yourself making the same dinners all the time, I encourage you to branch out this year and try some new dishes. The only way to find out if you like new, healthy ingredients is to jump in and try them! Add new flavors and tastes to some of your basic staples, like chicken breast and brown rice, and you may find you like exploring in the kitchen more than you thought you would. One thing you may have never thought to cook with is pomegranate. POM Wonderful 100% Juice is full of antioxidants because it’s got 2 whole-pressured pomegranates in each 8-ounce bottle! That means you get a ton of powerful polyphenols in each serving. 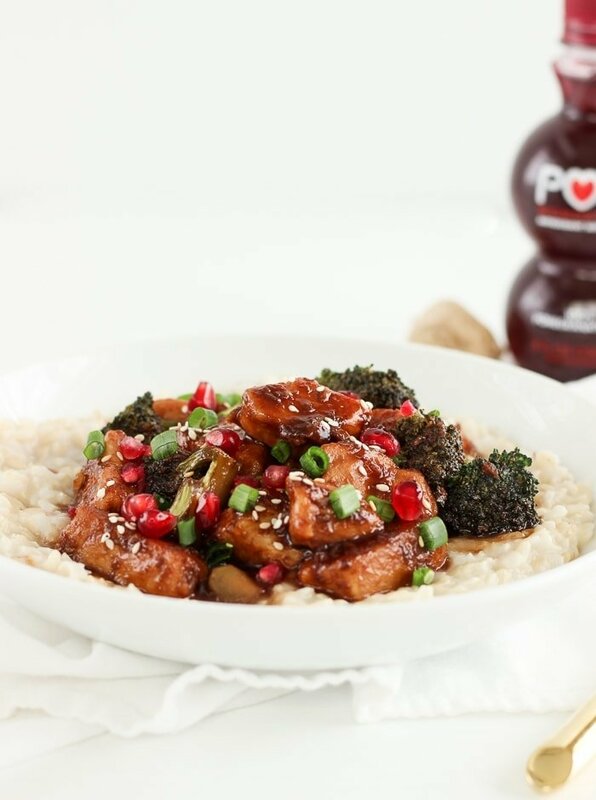 Pomegranate juice is a healthy way to add a ton of flavor and antioxidants without any added sugar to otherwise savory dishes, like this Sticky Pomegranate Ginger Chicken and Broccoli. 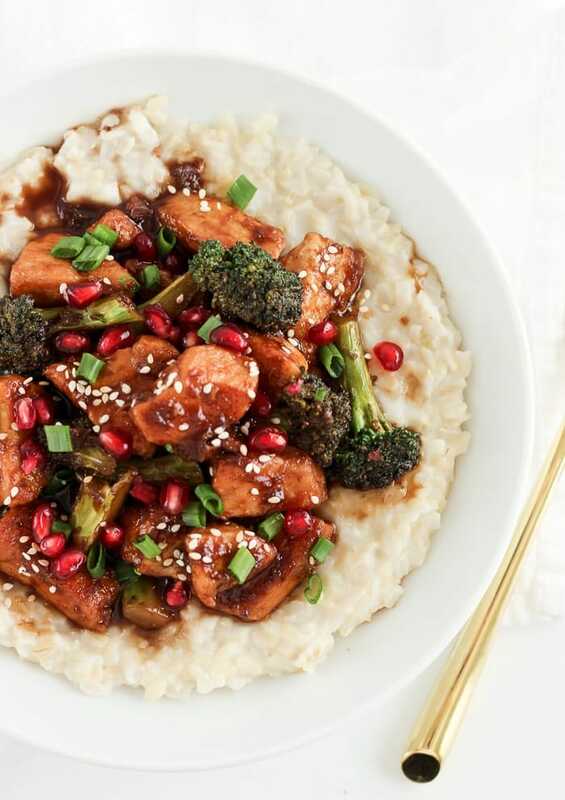 This Sticky Pomegranate Ginger Chicken and Broccoli packs a serious flavor and nutrient punch in one simple dinner. 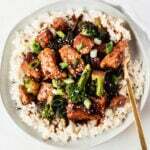 The sauce is made with only a few simple but flavorful ingredients, so that you only have to whisk together the sauce, then cook the chicken and broccoli while the rice steams. 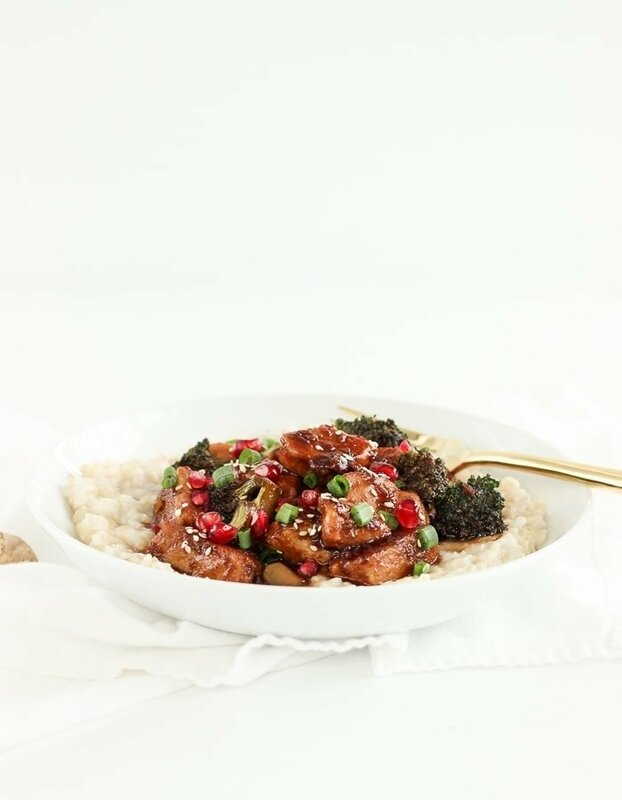 You end up with a sweet, sticky, slightly tart Asian-like dish that is loaded with protein, fiber, and tons of antioxidants! 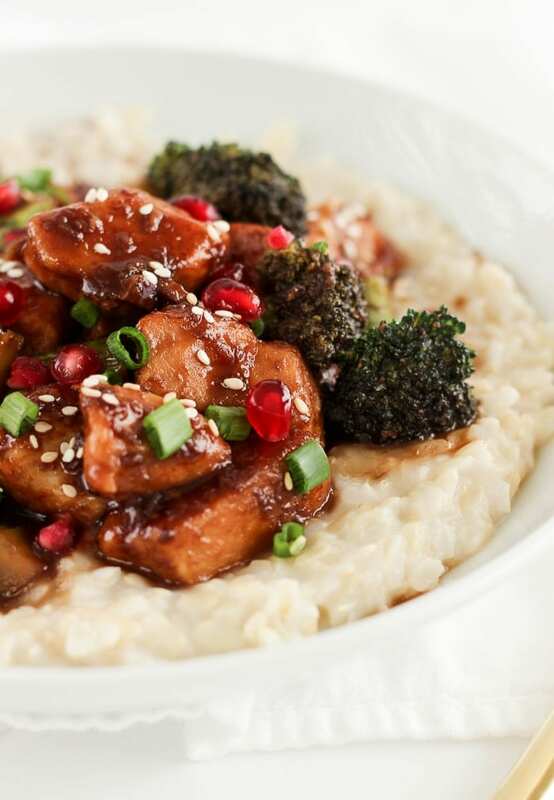 I also spiced up plain old brown rice with coconut milk for a more flavorful base for your sticky pomegranate chicken. Together, this dinner is easy, healthy, and delicious, and it’s perfect for getting your feet wet with more exciting dinners! Is one of your goals to try new things this year? If so, I want to see the things you try, whether it’s food related or not! In a small saucepan, whisk together all sauce ingredients. Gently simmer over low heat until reduced by half (about 30 minutes). Meanwhile, prepare the rice. Add rice, stock and coconut milk to a saucepan and bring to a boil. Cover, turn heat to low, and simmer until rice has absorbed all of the liquid, about 45 minutes. When rice has about 15 minutes remaining, heat sesame oil over medium heat in a large nonstick skillet or wok. Toss chicken with cornstarch to coat well. Brown chicken on all sides, about 10 minutes. Add broccoli to skillet and cook, stirring, about 5 minutes. Add sauce to the skillet and stir to coat. Continue cooking over medium-low heat until sauce is thickened and chicken is cooked through, 5-10 minutes. Divide rice into bowls. Top with pomegranate chicken and sprinkle with sesame seeds, green onion, and pomegranate arils. Serve immediately. Ooooh I cannot wait to making this – pinning now!